Every now and again, I get called to work on tiled floors which have were laid some time ago and not properly maintained in a long time, as was the case with this customer in the town of Bedford at the heart of Bedfordshire. 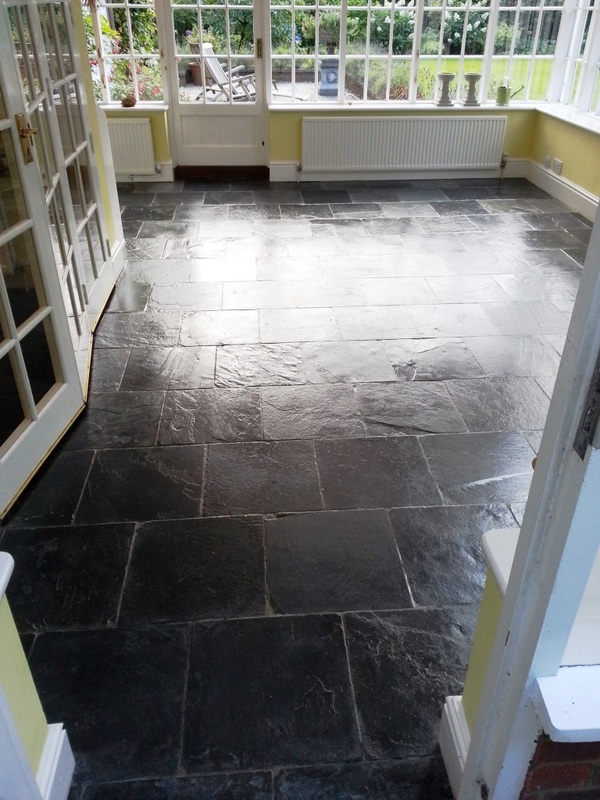 They had a twenty year old Slate tiled floor that was now in need of a thorough clean and a re-seal. As you can see from the photos, the floor was very much worse for wear in some areas, with the tiles looking very dull and dirty. To clean the tiles I used a combination of a steamer and a solution of Tile Doctor Pro-Clean, a high alkaline cleaner suitable for use on many different types of natural stone floor, including Slate, Limestone, and Victorian tile – just to name a few. The solution is scrubbed into the tiles to lift out the ingrained dirt and stains. Concentrated Pro-Clean is also strong enough to strip off the old sealer from the floor. After completing the clean and inspecting the tiles to ensure all of the problem areas had been successfully tended to, I rinsed the floor thoroughly with water to remove any trace of cleaning product. After rinsing the floor in such a way it is important to leave plenty of time for it to dry before sealing, so I left the house for 24 hours before returning. Upon my return to the house, I inspected the floor to ensure it had dried completely, as any excess moisture remaining of the tiles has the potential to damage the performance of the sealer. The sealer I used was the new and improved Tile Doctor Seal & Go known as Seal and Go Extra, which has an acrylic base and a much higher content of solid. This means that when the sealer dries it is able to provide an even better level of protection for the stone. I applied several coats of Seal & Go Extra to give the Slate tiles a stain resistant surface seal and the high quality finish the client had requested. Seal & Go Extra is suitable for use on internal and external, unsealed porous surfaces such as textured Quarry, Sandstone, Victorian tile and, of course, Slate. 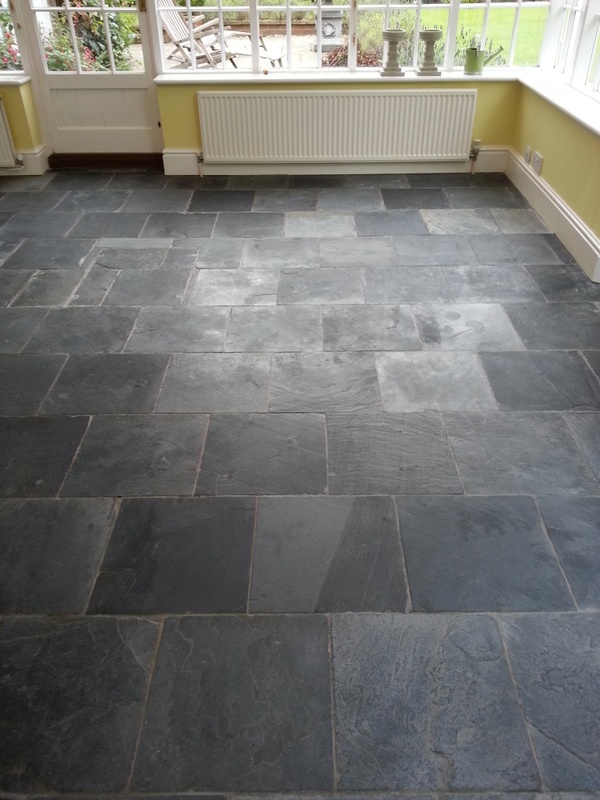 This entry was posted in Slate Tile Posts and tagged Bedford, bedfordshire, slate tiles, tile cleaning, tile sealing by AbzDominise. Bookmark the permalink.